Bartneck, C., Berg, F., Compen, C., Wessel, A., & Groenendaal, B. (2007). Cats and Dogs. In C. Bartneck & T. Kanda (Eds. ), Proceedings of the 2nd ACM/IEEE International Conference on Human-Robot Interaction (pp. 178). New York: ACM Press. Abstract - Robots will not only need to be able to provide positive feedback, but also negative. 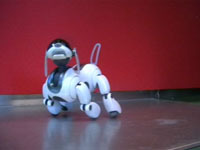 This project explored the abilities of the robotic dog Aibo and the iCat robot to express pain. For two different robots 30 different levels of pain expressions were designed and tested. The results showed that participants are able to recognize small differences in pain expressions. The movie shows several representative expressions.